If I could go back 8 years to when my son was in 1st grade (or 10 years to when he was in pre-school) this is what I would tell myself. I’d be very blunt and that’s okay because it’s myself. Just stop. Put away your schedules and Charlotte Mason books and Sonlight book lists and CC Scope & Sequence and dreams and goals and pressures and worries. Stop doing school. Focus on heart attitude and obedience first. We will get to school in a few weeks. Or months. But we need to get some things in order first. Your children need to obey you and they are not. If you ask them to go sit in a chair, they argue and complain or throw fits. Work on that. Get them to sit in a chair when you ask. Or for the toddler, get him to stay in a pack and play when you tell him and not climb out. Here’s a great talk about that. Now, at this point I know you are getting worried, younger self. You are thinking maybe this is too harsh, maybe you can distract or cajole them into doing what you want. Why do they need to sit in a chair anyway? Can’t you just make this work? In fact, couldn’t we just take everyone to the park and ignore this whole thing? I’ll tell you why. The chair isn’t the issue. Obedience is the larger issue. Respect is the larger issue. Who is the one in charge of the home is the issue. If your children don’t obey you, you will spend the next 5, 10 years in constant battles. You will not be able to enjoy them. They will be discouraged that they are constantly in trouble and you are constantly mad at them. There will be very little joy. You will be exhausted that no one listens to you. You will know they are brilliantly smart and so frustrated that school takes forever. You will feel like they are in control of the house but you won’t know what to do about it. So focusing on requiring them to obey isn’t mean. I know all the stuff you read in parenting magazines, and our American culture really makes it feel mean and to let the kids decide everything but that doesn’t end well. That ends with spoiled, rather obnoxious children. It ends in you exhausted from their demands and them moody when they don’t get their own way. It ends in depressed teenagers. So even though this seems like a small issue, getting them to sit in a chair, it isn’t. It’s the foundation. Also, the Bible says for children to obey their parents. God is very clear. So, go back, younger self, and do a Bible study on Proverbs. Who is in charge, the parents or the children? Who is teaching? Who is listening? Who is called wise, the parents or the child? Who is in charge? Good. Now copy Hebrews 12:11. Is discipline fun? Is it fun for you, my dear younger self? No, it is not. But you know what’s really not fun? Stressful dinners for 10 years because no one listens to you. Conflict with your child so that your relationship is fraught with anger, tears, hurt feelings. It is so much better to deal with these little weeds before they choke out your garden. So, this is a huge deal. Yes, the world says all these academic, social, things are critical. You are worried you will be behind. Before you start this, listen to these talks about: First Time Obedience, and limiting choices (the funnel). And these talks for toddlers, preschoolers, and older kids (Understanding Freedoms part 1 and part 2). Okay, now your child will sit in a chair when you tell them to! This is huge! This is foundational! This is great! Celebrate! The next thing, younger self, is plan on a training time with your children first thing after breakfast. You can work on a few things: obedience (yes, Mom), patience (sitting and listening to something for a couple minutes, stretching this out), self control (sit time again). For toddlers you can work on blanket time or coming when they call you. Or whatever other issues you see. Just set aside some time to be proactive with your teaching. Instead of reacting to misbehavior, start using this time in the mornings to teach and train. You can teach a Bible verse and then a practical skill to help them. You can ask them to do a chore and use this as a training time in obeying cheerfully, giving them another if they complain. You can play the Yes, Mom game. Okay, so now after a few weeks your children should be obeying better. Oh, and limit their choices during this time. In fact, give them almost no choices. Because they pretty much think they are in charge of everything. And in case this seems like just mean Christian fundamentalism, read this book, Bringing Up Bebe. In France they call this the ‘cadre’ or the frame. And they say “It’s me who decides.” The parents have a tight frame, structure and control over their children’s day. They proactively train their children in waiting patiently, in being respectful and polite and in developing a taste for healthy foods. It reminded me of how parenting was in the U.S. in the 50s. Or what I know of it from Mrs. PiggleWiggle books. · Self-control, the ability to sit still and listen (sit time) – this will reap huge benefits in read aloud time, on airplanes and at stores. 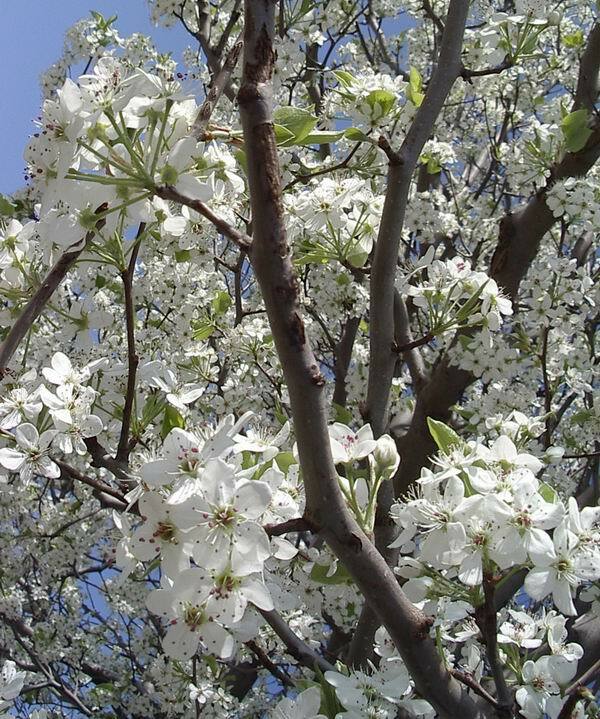 · Contentment with what Mom chooses: food, activities, clothes, etc. And academic work and chores are a tool to teach them these skills. I don’t even want to call them character qualities. I mean, they are, but they are also skills that can be learned and practiced. Starting small and building up from small successes. So yes, with your toddler, start with one minute of sitting with his hands in his lap, on mom’s lap, not squirming to get out. I know it seems mean. But oh, the dividends it will pay! The few minutes of training pays off on a plane ride. In the grocery store cart. When he has to sit in a class with you because someone’s late. On and on. I know you don’t see it now. But I’m telling you from the other side, do it! And the benefits are amazing. Not just to you, for whom of course this makes life, school, your home easier and more peaceful. But this is also amazingly beneficial and comforting for your children. They will be happier when they don’t feel like Mom is mad and frustrated at them all the time. They will be happier kids because they don’t expect to get their way in everything. They will have learned, because you will have taught them, how to be content. You will not be afraid to go places with them because you never know what they will do. You will be able to minister to people because you know your child will not be out of control. It truly does bring a harvest of righteousness and peace. So, stop reading all those homeschool books, my dear younger self. Put down the parenting magazines. Read these two books: for younger kids and this one for older kids. Get the French book from the library (it’s really fun and entertaining too). Listen to these MP3s and then these when you work out at the Y instead of watching HGTV. (I mean, you can still watch the video while you listen to the MP3 if you want. Or you can watch HGTV after each MP3 as a treat.) And dig into what the Bible says about parenting in Proverbs. And I know you didn’t have podcasts back then but if you did, this one is really good. Pray God would help you obey, even if it feels risky. Even if it feels counter-cultural. Even if it feels hard. Even if you’re worried you’ll ruin your relationship with your child. You won’t. You’ll strengthen it, because they will listen to what you want to teach them. You can be gentle and kind and loving (2 Tim 2:24). But be firm. Require respect and kindness in your home. Require obedience in your home. You don’t have to spank to do this. It’s okay for some people, and it’s certainly an option, younger self, but since God has led you to use mostly other methods of discipline, that’s okay. You may have to spank a handful of times when you are training them to stay in the chair or pack and play, but that’s it. It won’t be as bad as you fear. Once they get the basic idea, the chair will become the discipline, or consequences, or loss of freedom. You won’t be spanking much at all. Now, you can start to structure your day because they actually obey. Before, you could come up with any schedule you liked, but it never worked because everyone argued with you about everything. But also, once you have some of these things going, don’t be afraid to pause. Even if you had other plans that day. Just pause. If your child isn’t doing school with a good attitude, ask him to just go sit in the chair until he’s ready to obey with a good attitude. It might take 4 hours the first time. And 30 minutes the second time. And 5 minutes the third time. They learn really fast. But don’t go on. That’s what I want you to hear. Don’t press ahead, getting madder and madder. If they roll their eyes, have them sit. If they argue or whine, have them sit. If they complain about why they have to do it and brother doesn’t, have them sit. Maybe give them a warning the first time, but after that, just kindly ask them to go sit until they are ready to work cheerfully. Same if you’re out. Pull the car over. If the kids are arguing and screaming, pull the car over, quietly talk to them, and work it out. You don’t need to put up with this. They can learn not to scream at each other, demand the things they want on the CDs, and act silly to get out of things. They can act nicely at dinner. Stop putting up with it. With God’s grace and kind, firm teaching and training, it can be different. And also, I’d tell myself, it’s not too late for the oldest. It’s not too late at 9 years old. Or 12. Or 14. That’s what I’d tell my younger mama self. She might or might not have listened. But I think she might have, because she really was at a loss in the discipline area for a looong time and people don’t want to tell you what to do. She wanted someone to tell her what to do, with helpful practical information that worked. I’m so thankful for the resources God has brought my way. I’m thankful for the wisdom of older women. I’m thankful my relationship with my older children is better now after so many rocky years. My oldest especially seemed, oddly enough, to really thrive when I really required respect and kindness in our home instead of letting things go and constantly reminding him. And with my toddler, I’m spending way more time proactively training him in all kinds of things: Yes, Mommy game and practice, Blanket Time, Pack and Play time, Sit time (on my lap), how to interrupt politely, how to like healthy foods, No Touch, etc. But I’m spending way less time frustrated and exhausted with a demanding toddler. Don’t get me wrong, it’s not easy! It’s so much work!!! Taking the time to correct yelling instead of ignoring. Taking time to practice the right behavior instead of just going on. Taking time to correct him if he gets off his blanket during Blanket Time. But as a result, he is a sweet, relatively obedient child. And he’s so happy! He’s content on an 8-hour plane ride. He makes friends everywhere. He can sit on my lap for 30 minutes during brother’s co-op class. He can be in the room listening to Trumpet of the Swan (for very short periods, like 5 minutes, but we’re working on it!) or just be around us more because he’s not a constant disruption. And my third-grader actually obeys, praise the Lord! (You know, most of the time.) He gets his school done so we can actually have read aloud time and nature walks and art and play soccer. We can have days with truth and beauty because the foundation is pretty solid. The fun things can happen because of the work on obedience on the front end. So, the time you put in is worth it, Moms. It’s hard, but when you’re being proactive instead of reactive, it’s not so exhausting somehow. I pray this was helpful and you’d benefit from some of my many and varied mistakes. Blessings on you and your sweet children. We started with 30 seconds. When he stood up, I’d say, “Oh, no, no, sit until Mommy’s timer beeps.” and I’d gently push on his shoulders to help him sit. And I’d say, “Let’s try again.” or “I’m going to start the timer over.” Not mad of course, just in a happy relaxed tone, and with the attitude we’d keep practicing until we got it. So the first time we had to keep resetting the timer to even get to 30 seconds! So it took maybe 10 minutes. But when he did sit for 30 seconds, I really praised him, told him what a good job he did, clapped and celebrated, then went off to play or do something else. I also kept a little chart on a piece of notebook paper that showed me progress because it was mind-numbingly slow! And pretty boring for me to have to keep sitting by him and working on this multiple times a day. After a day or two he could sit for 30 seconds without a reminder. Then we went up to 1 minute. When he could do that successfully we went to two minutes. It felt like it was taking forever, but after two weeks we were up to 7 or 8 minutes, which actually was long enough to be really helpful at times when I needed him to sit. And it truly was a great help on the plane ride (and in 2 hour Kenyan church services), because he was used to the concept of “sit time” and I’d just remind him when he wanted to stand up and jump around that this was sit time. So it didn’t seem to matter that it was hours instead of minutes, it was the idea that he had to sit until Mom said time was over that was helpful. Some people continue using “sit time” daily, but since we do Blanket Time and Pack and Play time (with toys and a CD), I don’t have this as part of our daily schedule. But I am transitioning to this as a consequence. Instead of putting him in the pack and play if he scribbles on a book (on purpose) or screams at or hits his brother or something, I’m having him sit in the kitchen (or wherever I am) with his back to the wall and put his hands together for 1-2 minutes until he “has self-control,” then we talk, he says he’s sorry to brother, we pray, and he can get up. Also, for my others, they did go through a few days where they were just defiant about sitting where I told them. I mean, after they’d had plenty of practice and clearly knew they weren’t supposed to. That’s where I spanked. One swat. I’d warn them very clearly that if they got out of the pack and play or chair they’d get a spank (one swat). They tested a few times and decided quickly they didn’t want to do that. And with my middle two, that was the only thing I ever spanked them for. (My first one I was generally confused and don’t remember except that I didn’t do it very logically or well.) But once they’d sit, that became the consequence I’d use. Plus maybe extra chores or something if they needed an additional consequence. Hope all those details are helpful! If I could go back 8 years to when my son was in 1st grade (or 10 years to when he was in Kindergarten) this is what I would tell myself. I’d be very blunt and that’s okay because it’s myself. I’m not writing regular posts for this blog anymore, but I just have to show you pictures of my now 4-year-old’s preschool area. My goals with it were that he would a) have something to do during school time b) have it be in the same room as the rest of us, but be his own space and c) be as quiet as possible so it didn’t distract my son (9) and daughter (7). His little “house.” The others aren’t allowed in unless he invites them. House/cooking area: wooden vegetables and an old pot and spoon. Dollhouse: made with duct tape and cardboard by big brother & sister for his birthday. I wanted to blog for a year after the book released in March 2012. Mostly because I haven’t been a homeschool blogger so nobody really knew who I was, or what I had to say, or if they were at all interested in reading anything I’d written. I wanted to give people a glimpse into my writing and life to see if they connected. Also, I wanted to share snapshots of our life over the course of a year, thus the “A Year In The Life” section. My original plan was not to build a big blog audience. It takes a tremendous amount of time and mental energy to do that right, and I know that’s not what God is calling me to do right now. Every time I pray about it, He confirms that. It’s not the season of my life to take on another job. I need to have fewer things on my to-do list and more time to sit around with my family and listen to them undistracted. Un-plugged. I love writing. I love putting words together. I love seeing the miracle in the little moments and painting a picture with poetry. But a year has come and gone and it’s time to say goodbye. I went a little past a year because I wanted to tell you about the planned trip to Africa, then I needed to tell you about the unplanned trip to Africa. But now, it really is time to say: Fare Well. Fare well in your homeschooling journey, your mothering journey, your wifely journey. May God bless you and give you peace. My intent is to post updates on Facebook every week-ish or month-ish, just interesting things we’re doing or funny things you might enjoy. Also I may do guest posts on other blogs very occasionally, so I’ll post links to other writing I do on Facebook . Thanks so much for reading and commenting, friends. 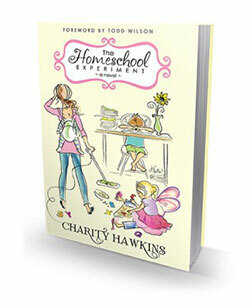 I know there are lots of other homeschool blogs, so I pray you would be encouraged by those. and let our ordered lives confess the beauty of Thy peace. Sometimes I wonder if our house is actually on the moon, unhindered by so much gravity. Because my children tend to float up onto the furniture with no warning and, at least according to them, entirely by accident. Today I looked at my nine-year-old son, whom I had just gotten out of time out for climbing all over the couch and setting a bad example for his brother during reading time, and he was climbing up the arm of the couch. Thirty seconds after he had promised he would sit still like a normal human. “Oh! Mom! I don’t know how I got up here! I’m sorry!” And he genuinely was. He had no idea that he was floating up the furniture. Again. Anyway, despite the fact that no one seems to stay attached to the ground or sitting for more than 30 seconds, we’ve been doing a lot of reading around here lately. Mostly about one topic: Africa. Because we’re going. That sentence strikes fear in my heart. Also, excitement. And trepidation. And joy. And terror. Sort of like homeschooling. No, I’m thrilled we’re going. I want my kids to see the world, more than our little tidy piece of it. I want them to serve others and learn compassion and have practice being uncomfortable. And yes, we could do all those things here in Oklahoma. But we have the chance to go visit some friends, serve them and just do whatever we can (working out some details still) to refresh their hearts (I hope). Then I decided to stop worrying about it. I went to the travel.state.gov website to find out what immunizations we needed. There I read about a travel alert to Kenya that warns people to be alert after a few instances of kidnapping and murder. Fabulous. I’m not going to worry about it any more. As the events from this week illustrate even more, there is no place that is perfectly safe, even those we’d like to think are. God is in control of our lives here, our lives there, and everywhere in between. In preparation for our trip I found whatever our library had about Africa. 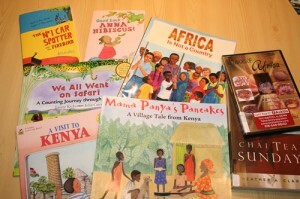 We found some picture books, a DVD on the food there and some Swahili CDs. I’ve made one Kenyan recipe. I want to make “ugali and sukuma wiki” but haven’t done it yet. I need to find out where to get goat meat. We’ve been reading those, listening to some CDs and generally trying to soak in what we can. I feel like we haven’t done much because we’re still trying to do those pesky subjects like spelling and math, but I’m hoping to focus on it more this summer. Wherever you are going this summer, you can do the same, just get some books, learn a bit about it ahead of time, and dig into whatever interesting culture you can find about that place. So much fun! 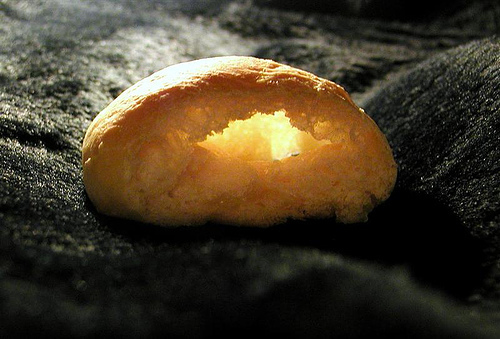 Bake some Pillsbury sugar cookie dough into one huge flat cookie. I covered the entire pizza pan. Cool. Frost in white. Trace shape of continent, country, or area in toothpick (so you can correct mistakes) into the frosting. Cut out shape. (It doesn’t have to be perfect, as evidenced by my weird-looking Africa.) 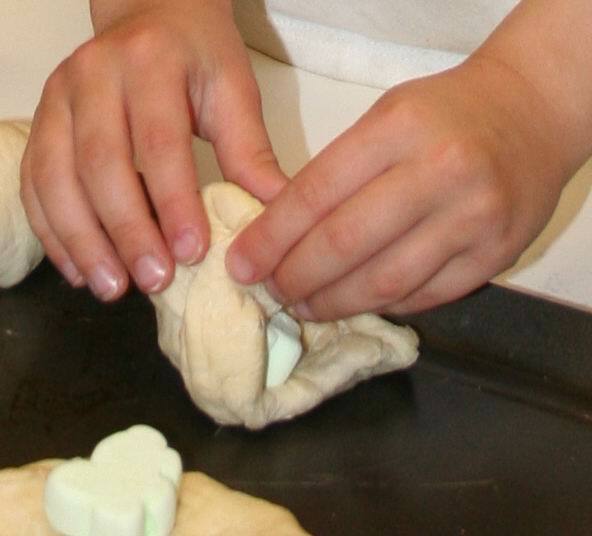 Put wax paper or foil around edges of cookie (to be the water or boundaries of the area). Have kids help decorate (my kids didn’t help until this point). 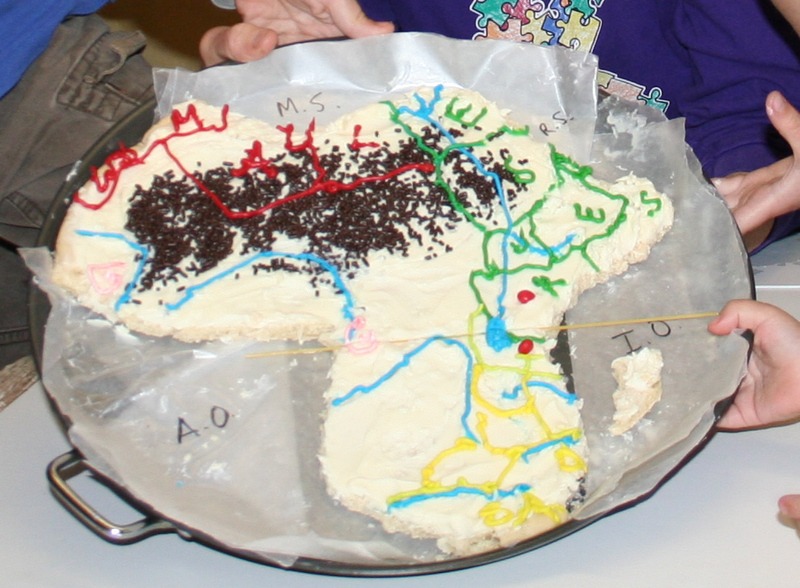 We used chocolate sprinkles for the Sahara Desert, frosting for rivers and some country boundaries, red hots for mountains and one piece of spaghetti for the equator. Licorice would have worked if we had had any. Take pictures, share with friends and enjoy! Are you planning any trips this summer? Are you doing any fun learning before you go? get Easter egg dye and a salad kit for Easter dinner, we picked up some rolls and marshmallows too. Get some yeast freezer rolls, the kind that have to rise for 3-5 hours. Let them rise. Once the rolls have risen, your kids can flatten them out hide a big marshmallow in the center of each one, wrap the roll around, sprinkle with cinnamon and sugar and put it on a cookie sheet. Bake the rolls according to instructions on the bag. When the rolls are done, the marshmallow is gone! It symbolizes the empty tomb! 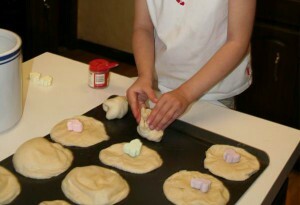 These rolls are a great, easy, fun activity and can be served with the Easter meal or as dessert. Here’s a link that shows doing it with Crescent rolls. http://savingdollarsandsense.com/resurrection-rolls-recipe.html Either type of rolls would work fine, and Crescent rolls are probably easier since you don’t have to wait for the dough to rise. We just have always done it with the frozen kind. From top, clockwise: horseradish, Charoset (apple mixture), Matzoh (unleavened bread), parsley. If you have small children and/or are overwhelmed with life and its responsibilities, feel free to skip right over this. I don’t want you to feel like it’s one more thing on the list of things to do. Our family chooses not do some other traditionally Easter activities, like visiting the Easter Bunny at the mall, or elaborate Easter Egg hunts, so that we (I) have time and energy for things like this. called our Passover Lamb. Coincidence? I think not. 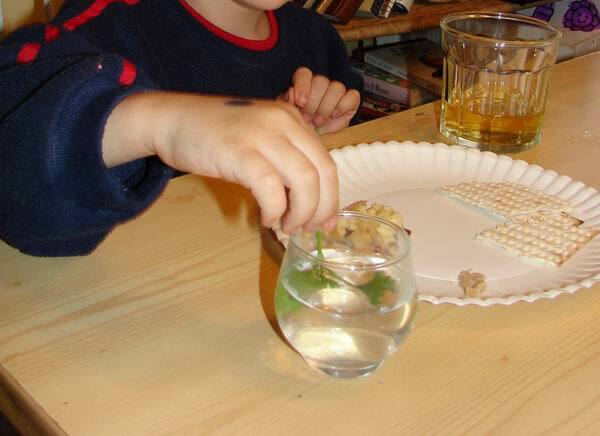 matzoh crackers (usually there is a Jewish display around now, with all the kosher food). These are crackers without leaven. They’re good! Chop up the apple, mix with honey and raisins or walnuts to form a sweet mixture. 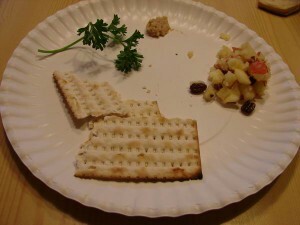 On everyone’s plate put a little piece of parsley, a small dab of horseradish, three pieces of matzoh crackers, and a spoonful of the apple mixture. Give everyone a glass of juice. Mix up a cup with water and salt, enough salt so it tastes salty. You can just have one for the table. From top: horseradish, Charoset (apple mixture), Matzoh (unleavened bread), parsley. family around, light a candle to show the feast has begun. and their sons were saved. Then he brought them out of Egypt and saved them. 2. 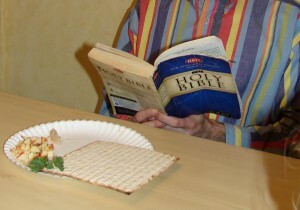 Read New Testament – “So the Israelites kept having this Passover meal every year to remember how God saved them. Did you know Jesus celebrated the Passover with his disciples right before he died?” Read Luke 22:1-22 or summarize. We’re going to celebrate this Passover meal just like Jesus did. eat it. God’s love for us is sweet, isn’t it? he died for us. You can drink some. morning) he rose from the tomb. Then, finish up with the first verse of “Christ the Lord is Risen Today”. Now, when your children read about the Passover Feast, and later, take communion at church, they will know the history of it a little more. Here’s a version of the Seder from the Focus on the Family magazine. I would say it’s medium-complicated. So maybe start with the simple one above if you have young kids, then graduate to the Focus on the Family one. Please let me know if you try this, or if you already do it, and how it goes! A cute cutting board for making fruit salad. Kids younger than 6 or so can use butter knives (not these sharp paring knives) and can cut bananas, apple slices, and strawberries with help. I love when God just orchestrates things so I have a few extra hours to get things done. A friend ended up watching my two little ones today so our sons could play LEGOS (and argue about Battleship). I got to wrap birthday presents and now even have time to sit and write this blog post that I’ve been thinking about for weeks but haven’t had time to write! 1. Special Birthday Book – I got a journal for my son and daughter and my husband and I wrote a note to my daughter (and plan to do my son’s tonight) on her birthday. We mentioned skills she’s learned this year, areas we’ve seen her growing, gifts we see in her, and verses we are praying for this next year. I really want to take the opportunity of a birthday to cherish the uniqueness of each of my children, not just let it be a day for gifts and cake. I want them to feel so important as a part of our family. 2. Post-It Notes with Encouraging Words - my husband, my son and I all made seven sticky notes (my daughter was turning 7) and put them all over the house for her to find when she woke up. The look on her face was priceless as she woke up and started finding all these notes with things we love about her. The ones from her brother were especially precious, since many days they doubt whether the other one even likes them! This is mainly a gift of time. We probably spent two hours the night before my daughter’s birthday writing the notes and in the book. 3. Gifts that encourage a wholesome interest - Sometimes it seems like all the toys are violent, or battery-operated plastic junk, or just encourage frivolous things. We try to give books or toys that encourage a wholesome interest – this year for my daughter was horses, and my son it’s train tracks. We found several books on horses, and asked Grandma and Grandpa to give horse riding lessons (my daughter said that was all she wanted in the whole world) instead of a toy. She got a stuffed horse, a horse-shaped purse, etc. My older son surprisingly wanted wooden train tracks, but I jumped all over it because I think he will enjoy building intricate tracks and my younger son will enjoy lining up the trains. We found a Thomas train table with tracks, trains, buildings, etc. for $50 on Craigs List. For toddlers, I love the Melissa and Doug wooden dolls, wooden fruit and vegetable and other foods (healthy) to play with, play-doh, balls, and stickers. 4. Art/Craft Supplies - These are the kinds of things that encourage creativity. My daughter got play-doh, Grandma got her a doodle book, sometimes she’s had jewelry-making kits, paint, watercolors, and paint-a-birdhouse or model airplane type projects. 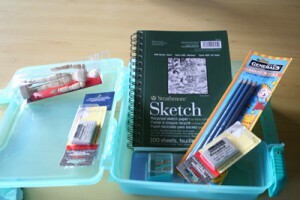 For my son this year I got a real sketch pad, graphite pencils, erasers, pencil sharpener, and a little art box to put it all in. It was fun to get to pick out some “real” artist supplies. Fabric can be interesting for dress up. One year we gave my daughter about two yards of: floaty rainbow fabric, blue sparkly fabric, and red satin fabric. The fabric has been made into capes, dresses, tents, and room decorations and is still used. 5. Tools that teach a useful skill - For example, cooking, building, gardening tools. 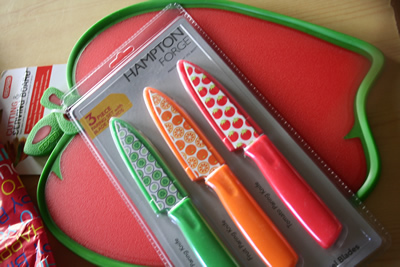 My son is turning nine this year, so I’m getting him kitchen knives and a cutting board to help make fruit salad and to acknowledge his growing responsibility to handle things in the kitchen. In the past we’ve gotten him a hammer, screwdrivers, duct tape, heavy string and other building supplies. I like that gifts like these encourage kids to develop useful, helpful skills, and not just look for things to entertain them. In the past we’ve gotten gardening gloves, small spades and watering cans for both my son and daughter. My daughter has received cute aprons, pink spatulas, and mini-muffin tins for past birthdays. For toddlers I LOVE to give mini-squirt bottles, cute broom and dustpan sets, and tiny aprons. They love to be big helpers. SOURCE: Pier1 has great broom and dustpan sets, kids scrubbers, and other cute kids stuff. It can be pricey, but they often have an area for end-of-season marked down stuff. I get most of our friends’ birthday gifts at Target, not in the toy section, but in the cooking or tool section. 6. Books. I love these, but feel so behind with great books that we haven’t even had time to read yet that we haven’t done these as much lately. I like to get the more unusual ones that the library doesn’t have, like the missionary biographies at Grace and Truth or the easy-reader ones at Mardel. My friend had the brilliant idea of audio books, which I meant to do but didn’t get around to this year. She says they also do this at Easter and other holidays, and specifically mentioned Focus on the Family radio theater as being excellent. My sister sells Usborne and I can’t help myself at homeschool conferences and used book sales, so we’re usually covered on great books. SOURCE: Grace and Truth Books (Christian hero bios and Christian heroes DVDs), Amazon, Focus on the Family radio theater. 7. Coupons for Mommy or Daddy Time – We did this last year, but this year didn’t because spring is such a busy time for us I can’t think about adding another event right now. But things we have done in the past include: Date with Daddy to a regular restaurant, then a fancy one for dessert, laser tag with Dad, tea party with Mom, and I can’t remember what I did with my son! Something boyish, I’m sure. One thing that has been completely magical to the kids is Moon Walks. I want to write a whole post about this. Twice a summer I get up at the unkind hour of five o’clock, grumbling in my head the whole while about how crazy this idea is, wake up ONE child, and take a special walk with that child as the sun rises. We live in the city, so we just walk to Quik Trip ( a gas station near us), but we walk hand in hand looking at the stars and moon, talking and listening, and then hear the “first birds of the morning” begin to sing. Sometimes we see ducks, geese, or rabbits. I try to ask my children heart questions and just connect with them. We then get juice and donuts (those nasty packaged ones that I think are disgusting but they think are the hugest treat ever) and walk home. This is honestly one of the things they remember and talk about and we should do it more but I hate getting up that early! I’m trying to rope my husband into doing it to double our moon walks without further encroaching on my sleep time. My whole point with that is just: make a special time with your child. It doesn’t have to cost anything. Just a few hours of your sleep and a quiet time (maybe outdoors) with them is one of the greatest gifts you could ever give. That’s all the ideas I have for today. What are the most special or well-loved birthday gifts you give at your house? So that means there’s a pile of clothes in my laundry room, the kids are watching more TV than I like, I’m counting the days until Spring Break, and I’m really tired of phonics. Every day, every day, I explain to one of my dear children, the difference between short and long vowels. We do cards and starfall.com and reading practice and games. How many days until Spring Break again? We keep on trudging. We do our best. I try my best to be nice, first of all. We try to do the work on our lists. Some days it feels like we make progress and some days it doesn’t. But I know February will pass. March too (which is usually worse) and then we’ll be heading downhill on all my plans for the year, the classes we have left, the books to finish (or not). God keeps giving me tests of patience and I keep failing. Sigh. Right now my back is out or something, I’m not sure, but I’m walking crooked and looking like a piece of corkscrew pasta. I’m seeing the chiropractor tomorrow. But meanwhile I’ve allowed it to be an excuse for being mean to my poor three-year-old whenever he’s disobeying and I have to pick him up and put him in his pack-n-play. I’m angry at him for hurting my back. Well, it’s not his fault my back hurts. It’s not his fault I’m tired. (It is his fault he’s disobeying, and we work on that, but I don’t have to be grouchy about it.) So, still praying, still trying, still falling on grace. I like that version even better than the one I’m memorizing. I like the “great patience” and “careful instruction.” My version says “longsuffering” and “teaching.” Either way, I’m to be a patient teacher. And I can’t get around the emphasis on preaching the word. Being ready in season (maybe when things are going well?) and out of season (maybe when they’re not). Am I preaching the word to my children? Do I even have the word in my mind at all, much less dwelling richly? Are we spending our dwindling time and energy on eternal truths at all or rushing to get through the list? Which will matter more in five years? These are the things I’m thinking about, yearning for, leaning toward. Even if we still have to do phonics. Grace to you, mothers. Keep walking, even now, even in February. May we know the word and be ready to share it with our children. We will all have opportunities, like them or not. May we all perservere until the sunshine comes out again. P.S. One of my dear children just came out and gave me a picture of all the foods they can think of (including patato, trunip and brocily-tree) they’ve drawn with little labels pointing to everything and most of the words even spelled right. It makes me cry a little. Somehow they learn things and are these darling, amazing little creatures, and I feel so privileged to get to be with them and see it all. Even if sometimes I forget.